Ellen Aitken passed away suddenly in 2014. But the legacy of the much-admired Dean of the Faculty of Religious Studies will live on in perpetuity through the recently inaugurated Ellen Bradshaw Aitken Graduate Fellowships. Professor Ian Henderson was in Winnipeg a few years ago when he got a phone call from the then-Dean of the Faculty of Religious Studies, Ellen Bradshaw Aitken. At the time, Henderson was teaching a graduate seminar on the religious and cultural diversity of ancient Rome. Aitken’s request: could he help put together an application for funding to take their students to Rome to see evidence of that diversity first-hand? The only catch: the application was due the next day. According to Henderson, it was an incredible chance to give their students a chance to be fully immersed in what they were studying, and a perfect example of what made Dean Aitken unique. “She had this knack for seizing opportunities,” Henderson says. “She would see something that might look insurmountable, like applying for something by tomorrow, and we would do it.” Not only did he and Aitken complete the application in time, but they received the funding – one of many examples of Aitken’s leadership and relentless dedication to graduate education. Aitken passed away suddenly from cancer at the age of 53 in June 2014, showing what friends described as dignity and grace in the face of a difficult illness. But thanks to the spirited efforts of a group of volunteers, alumni and former colleagues, who have thus far raised $300,000 in contributions, her legacy will live on in perpetuity through the recently inaugurated Ellen Bradshaw Aitken Graduate Fellowships. “If you could give Ellen a parting gift, this would be the gift you give her,” says Dan Cere, Interim Director of the School of Religious Studies, which is now part of McGill’s Faculty of Arts. 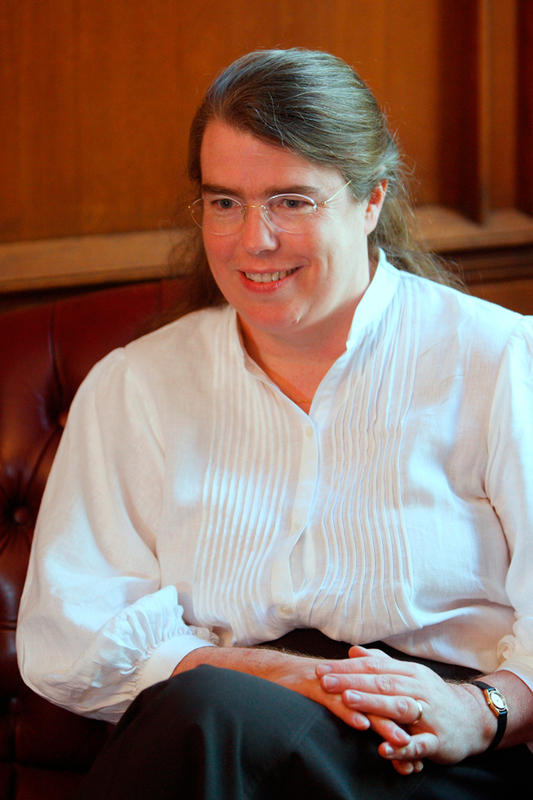 The Fellowship’s first recipient is expected to be selected for the next academic year and will be chosen from among graduate students in the School in any area of study – an apt way to recognize Aitken’s dedication to graduate education and her ability to reach across religious and academic lines in her work and her life. Despite her administrative responsibilities, Aitken maintained one of the largest graduate supervision loads in the Faculty. As Henderson notes, she was also uniquely able to combine academic rigour with a deep personal faith in her work. For the many former students, colleagues and volunteers whose lives were touched by Aitken, the Fellowship affords a means to make sure that her passion and commitment to the field lives on in future generations of scholars. “While she was unique, there are other individuals that I hope we can attract to our School of Religious Studies,” says Jonathan Birks, BA’67, chair of the School’s volunteer Advisory Board, which was instrumental in driving the fundraising efforts. To Birks, the most fitting tribute to Aitken would be the ability to support a graduate student who grows into a leadership role within the McGill community. “Maybe, in someone who receives this fellowship, we’ll find the next Ellen Aitken,” he says. Though the campaign has met its initial fundraising goal, donors can still contribute. Additional funds would allow the School to potentially expand the Fellowship program in the future. If you’d like to make a gift in support of the Ellen Bradshaw Aitken Graduate Fellowships, you can do so with the online giving form.